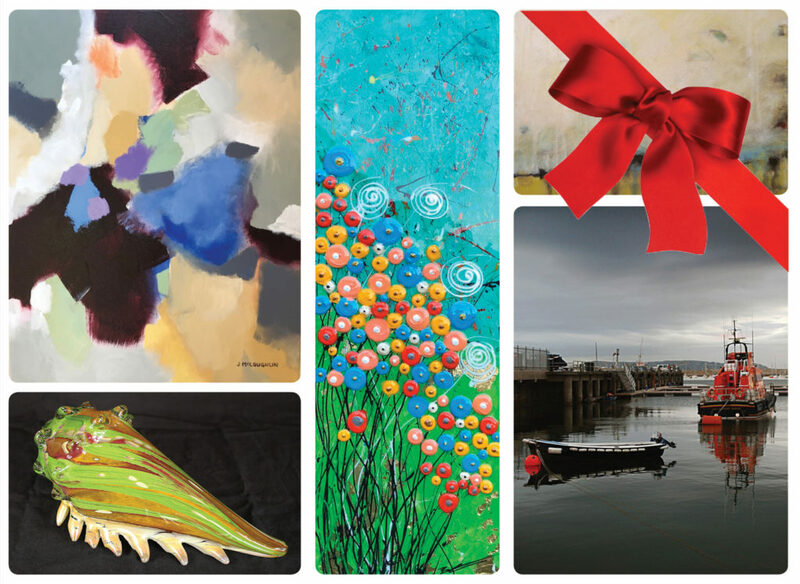 The new year brings a variety of brand new art by Art in Bloom Gallery’s core artists to the gallery. Feast your eyes on new work directly out of the artist’s studios. Art in Bloom Gallery’s core artists include: Bradley Carter (painting), Bob Bryden (printmaking), Debra Bucci (painting), Richard Bunting (blown glass), Elizabeth Darrow (painting), Brian Evans (ceramics), Susan Francy (photography), Mark Gansor (painting), Joanne Geisel (painting), Dumay Gorham (sculpture), Harold Hodges (photography), Dave Klinger (photography), Joan McLoughlin (painting), Jessie Robertson (painting), Gale Smith (painter), Traudi Thornton (ceramics), (Joe) P. Wiegmann (photography), and Kirah Van Sickle (mixed media and painter). Join us for the opening reception, held during the Arts Council of Wilmington’s Fourth Friday Gallery Night, on Friday, February 22nd, from 6-9pm. Visit with the artists and enjoy refreshments with live music by violinist, Shirley Lebo. The exhibit continues through March 23, 2019. Click here to view the work that was featured in the exhibit. Each year, the North Carolina Azalea Festival brings hundreds of thousands of guests to our downtown business neighborhoods. This year, we want to make sure we do everything we can to ensure these guests cross through our downtown business doors. The Downtown Window Decorating Competition celebrates what makes our downtown businesses amazing by highlighting their creativity. This is Art in Bloom’s first year participating in the contest. We are pleased to have two of our painters, Debra Bucci and Joan McLoughlin, designing and creating our window on Princess Street! 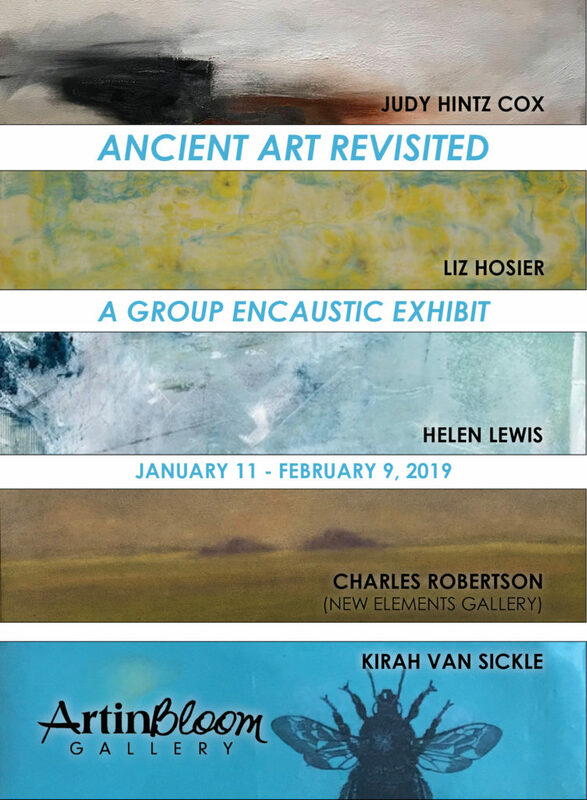 Art in Bloom Gallery’s newest exhibit features a group show of artists creating paintings with pigmented wax on surfaces such as wooden panels in “Ancient Art Revisited: A Group Encaustic Exhibit”. The wax is fused or burned via a heat source creating luminous qualities and colorful depths of layers. The exhibit features 5 artists working in a variety of media and techniques. Artists include Judy Hintz Cox, Liz Hosier, Helen Lewis, Charles Robertson (New Elements Gallery), and Kirah Van Sickle. The Fourth Friday Gallery Night reception will be held on Friday, January 25th from 6-9pm. Visit with the artists and enjoy refreshments. The exhibit continues through February 10th, 2019. Click here to view a selection of work from the exhibit. Join us for a first look at the new work of abstract artist, Bradley Carter. This exhibit features a selection of work fresh out of the artist’s studio. 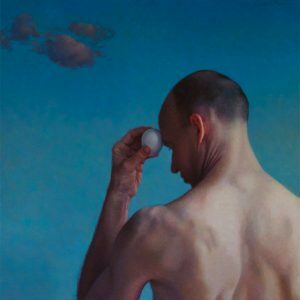 American Artist, Bradley Carter, is an award winning, international selling artist who grew up pursuing his passion for art in Virginia before moving to the North Carolina in 2007, where he currently resides in Wilmington, NC. 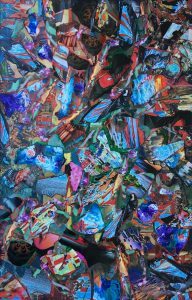 He predominately works in the medium of painting with his passion in Abstract Expressionism, but his works also include collage, paint skins, and furniture. Join us for the new exhibit, “Traveling Light,” and a collaboration between artist, Gale Smith, and fashion designer, Alice Blake Powell. “Traveling Light” is an exhibition of both hard and soft materials, light, movement, color and structure. Fashion designer, Alice Blake Powell and artist, Gale Smith have collaborated to bring new “out of the box” ideas to this exhibit. Gale Smith weaves RGB LED fiber optic fibers into several of her woven copper pieces that emit light into the design. Along with the fiber optics, she uses color to express the light and movement into her sculptural pieces. Alice Blake Powell has created a series of clothing pieces using recycled materials along with new materials. This up cycled fashion is easy to travel with and reflects light through illumination and creates a feeling of buoyancy. Gale will be donating a portion of proceeds from sales to The Arts Council of Wilmington and Alice will be donating to Dreams of Wilmington. The opening reception will be held on Friday, November 2nd from 6-8pm. Visit with the artists and enjoy refreshments with live music. The exhibit will be shown in conjunction with the “Thirteenth Grade” Art Exhibit located in Gallery 2. 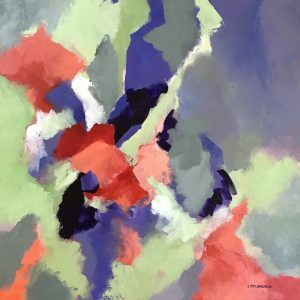 Gale Smith is an award winning artist, living and working in Wilmington, NC, with her works exhibited in galleries, private collections and corporate installations. Her newest interest is working with copper. As a plein air painter, she began using copper panels as her canvas and loved how the copper made her colors warm and vibrant. She experiments with different gauges of copper and mediums and discovered that inks and oils on copper made colors radiate vibrantly. 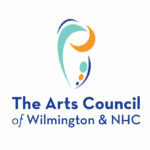 Gale will be donating a portion of proceeds from sales to The Arts Council of Wilmington. Alice Blake Powell currently resides in Wilmington, NC where she has worked in the film industry for nearly 25 years. Her resume includes over 40 television and major motion picture film productions such as Dawson’s Creek, One Tree Hill, Good Behavior, The Secret Life of Bee’s, Secretariat and Iron Man 3 to name a few. When Alice is not working film, she promotes her business “By the Hands” producing charity fashion shows and designing for local artist. Alice will be donating a portion of proceeds from sales to Dreams of Wilmington. What do you get when you have five high school artists who have worked together for five years? You get a gallery show on their Thirteenth grade year! The artists Harry Antoniades, Robby Carl, Sarah Miller, Jessie Robertson and Holly Woodcock have each developed an original style of work and continue to experiment in multiple mediums. Owner of Art in Bloom Gallery, Amy Grant first met the artists about one year ago and recognized the originality of the art and dedication of the artists. The students developed a detailed proposal for their own art exhibit at Art in Bloom Gallery. The student artists all attend Wilmington Early College High School and are taking art classes at Cape Fear Community College. 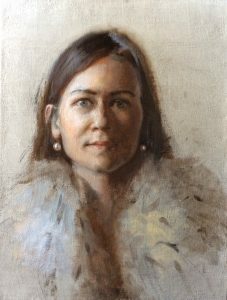 They have all been mentored since their freshman year by Dr. Janna Siegel Robertson who is their art club teacher. Besides creating art, the students have been learning about the entrepreneurial side of art by participating in craft shows and art shows this past year. 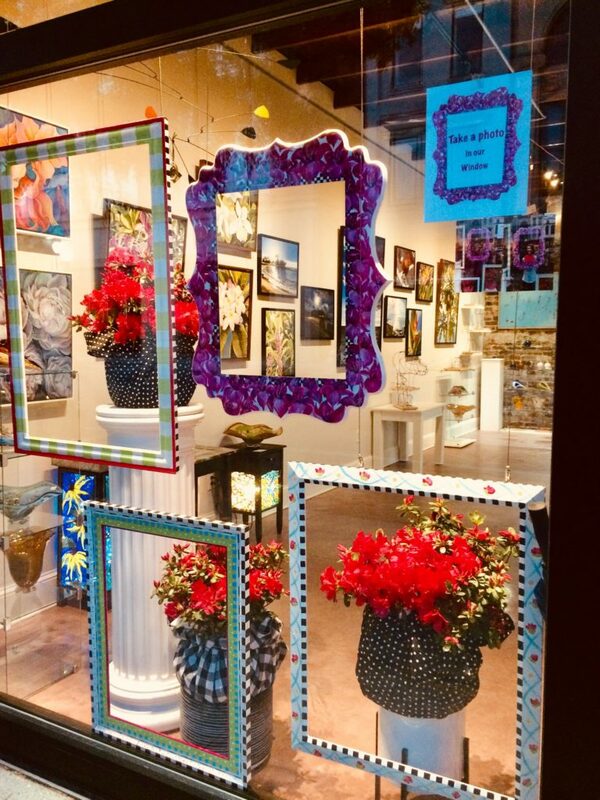 The opportunity at Art in Bloom Gallery is the first time their art has been exhibited in a commercial gallery. The opening reception is Friday, November 2, 6-8pm with the exhibit continuing through Saturday, November 24. Visit with the artists and enjoy refreshments with live music. The exhibit will be shown in conjunction with “Traveling Light” A Collaborative Exhibit by Gale Smith & Alice Blake Powell exhibit located in Gallery 1. “Art of the Gift” opens on November 30th and continues through January 5th . 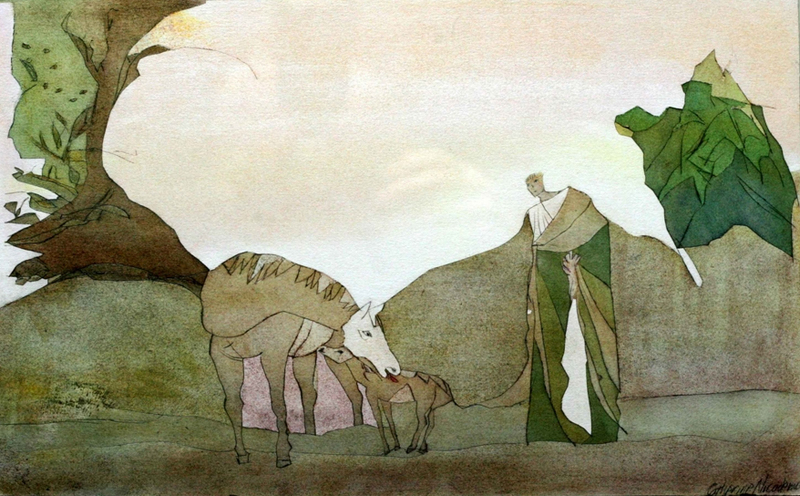 The art exhibit celebrates the holidays by featuring one-of-a-kind gifts selected from our collection of original art. Choose from exquisite jewelry, works on paper, ceramics, paintings, blown glass, sculpture, mobiles, stained-glass mosaics, and more. You will find something for everyone with prices suitable for the holidays. Gift Receipts and Gift Certificates are available just in case you can’t find exactly what that special person on your list might desire. Original works of art by local artists including: Debra Bucci, Richard Bunting, Bradley Carter, Brian Evans, JF Jones Mobiles, Susan Laswell, Joan McLoughlin, Cathie Schumaker, Gale Smith, Traudi Thornton, Kirah Van Sickle, Visions of Creation Gallery and many more! The exhibit and sale will also be presented alongside “Colors of Expression: Bradley Carter” exhibit with complimentary gift wrapping available. 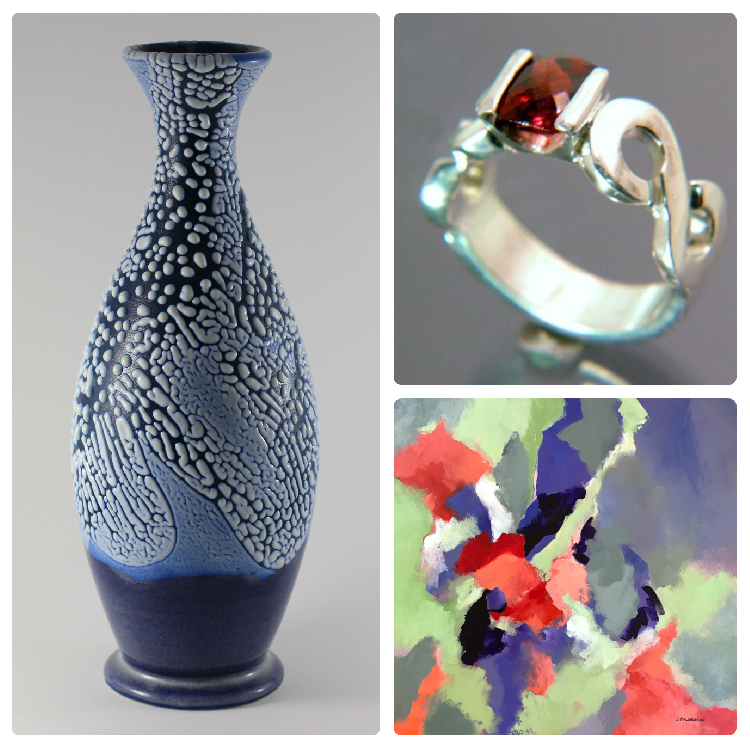 Join us for a new exhibit “The Last Song of Summer” by ceramicist, Traudi Thornton, and painter, Pam Toll. The opening reception will be held on Friday, September 7th, from 6-8pm. Visit with the artists and enjoy refreshments with live music by violinist, Shirley Lebo. Join us for the new exhibit, “Art of the Camera,” a group photography invitational exhibit curated by the Art in Bloom Gallery. This juried show invited an array of professional and amateur photographers to create a unique showcase of photographers working in a variety of techniques. The featured photographers in this group show include: Gary Allen, Steve Bower, Ralph Colelli, Joe DiBartolo, Frank Fierstein, Susan Francy, William Fridrich, Leigh Gill, Harold Hodges, Charles Kernan, David Klinger, Kate LeCates, Barbara Michael, Jessica Novak, Daniel Rogers, Arrow Ross, Barbara Snyder, Rachel Thompson, and (Joe) P Wiegmann. Join us for the new exhibit of watercolors and painting by Deb Klein Ahern. Her art is multi-faceted in its origins and its media, in its subject and its style, constant, current, and ever-evolving. She is a painter working in watercolor, oil, acrylic, print and mixed media. Deb has enjoyed a life-long passion for art, entering and gaining recognition at several art shows early on. Her 3-year study with Dale Boatman, an accomplished watercolorist, in Sierra Vista, Arizona, in the late 1970s, and her University studies in fine arts and art history in Tuscany, Umbria, and Veneto, Italy and Egypt in the 1980s, helped her immeasurably to “see” vivid color in the world. After 30 years of living in Germany, Deb has recently moved to Amelia Island, Florida and expects the terrain and light will once again change her work. Her works can be found in numerous private collections both in Europe and the United States. This exhibit will be one view in conjunction with the “Art of the Camera,” a group photography invitational exhibit curated by the Art in Bloom Gallery. 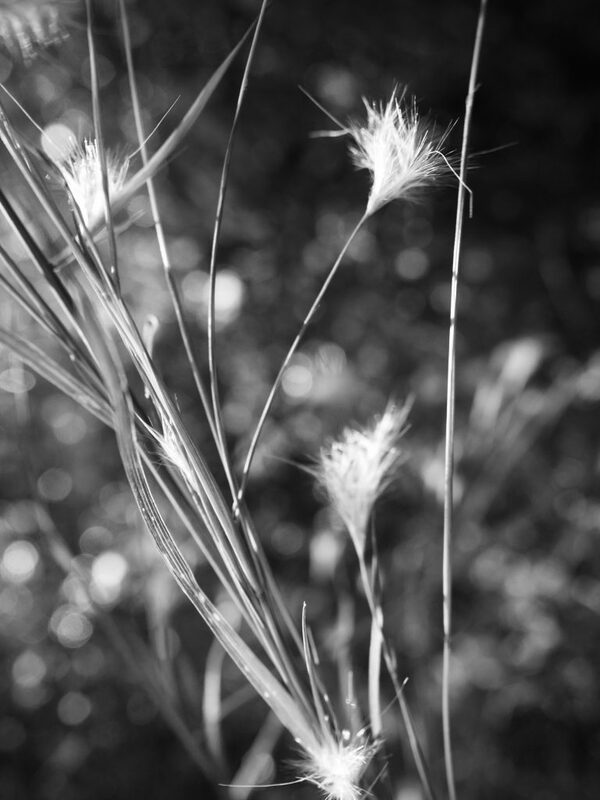 Join us for a first look at the new work of Wilmington’s own, Elizabeth Darrow. This exhibit will feature a selection of work fresh out of the artist’s studio. The art includes figurative work and abstract expressionism with oil, oil pastel, and/or collage on canvas. Elizabeth Darrow has made Wilmington her home since 1977. She works in a variety of styles depending on her medium, but usually does not work “from life” in the traditional sense. Most of the imagery that comes to her seems to hatch of its own accord, emerging from the process. Darrow enjoys working with color, repeating patterns and embedding humor (and angst) into her work. Each piece takes her on a journey of discovery where she hopes to lose herself to the process. Cinematic artistic expression is a key element of the Wilmington Jewish Film Festival. Now that aspect is being expanded with an affiliated art exhibit, “Jewish Art: Diverse Cultures”. 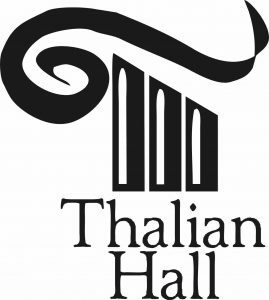 Original art will be on view and for sale at Art in Bloom Gallery from April 22nd – May 6th, with pop-up exhibits at Thalian Hall on Sundays and Mondays during the film festival. This community project is sponsored by the film festival for the first time with guest curator, Amy Grant, owner of Art in Bloom Gallery, 210 Princess St. in historic downtown Wilmington. Artists of all religions and beliefs were encouraged to submit original art for the exhibit. The artwork that will be exhibited was chosen to encourage and expand the understanding of Jewish culture and art. Each artist was encouraged to express his or her own interpretation of this theme, “Jewish Art: Diverse Cultures,” so the art exhibit will reflect different points of view. The artists included Debra Bucci, Bradley Carter, Elizabeth Darrow, Jay DeChesere, Joanne Geisel, Dumay Gorham, Jacqueline Jahn, David Klinger, Nick Mijak, Catherine Nicodemo, Catherine Porter Brown, Janna Siegel Robertson, Pam Toll, and Roberto Vengoechea, among others. 5% of proceeds from sales benefited the Cape Fear Equine Rescue. Join us for a new exhibit opening on June 1st! “Pathways to Understanding: Paintings by Joanne Geisel & New Work by Brian Evans” will be on view in the gallery. Both artists will be showing new works: traditional and abstract paintings by Joanne Geisel in conjunction with new sculptural work by ceramist, Brian Evans. The closing reception will be held on Friday, June 22nd from 6-8pm. Visit with the artists and enjoy refreshments. The exhibit will be on view until June 23rd. Click here for a preview of art featured in the exhibit. Joanne Geisel has been painting, teaching, exhibiting and selling her work full time since 2006. Her paintings attempt to capture the feelings, sights and sounds of her subject. She experiments with texture, edges, brushstrokes, palette knifes and layering colors on canvas to create depth, luminosity and beauty. Joanne lives and works in Wilmington, NC. She is on the faculty of The Cameron Art Museum School and the Leland Cultural Arts Center and conducts workshops for many other organizations. 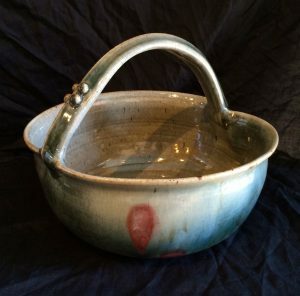 Brian Evans is a ceramic artist who finds inspiration from his surroundings. He uses textured glazes to emulate weathered or patinaed surfaces that are common due to the salty air of Coastal North Carolina. 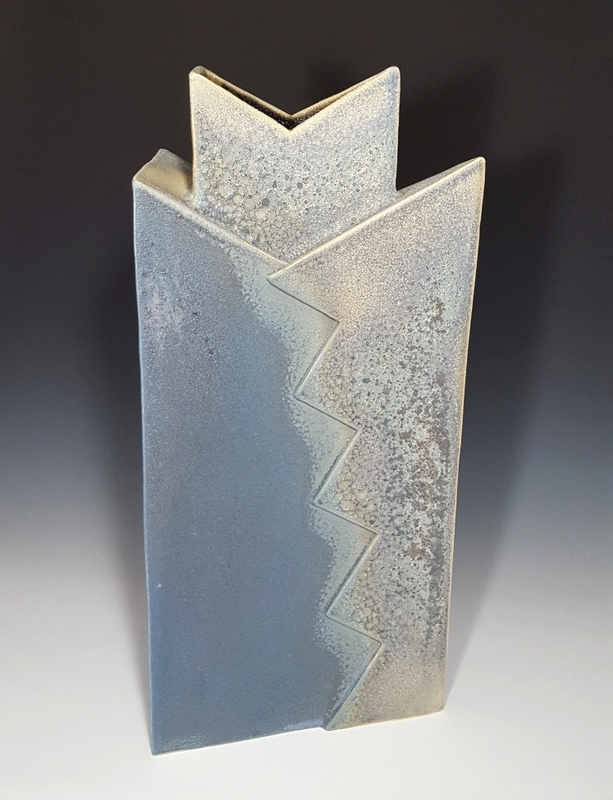 Brian began working in ceramics in 1995 through the Continuing Education program at Cape Fear Community College while searching for an outlet for artistic expression. He is a full-time ceramic artist. Brian is a founding member of the Coastal Carolina Clay Guild in Wilmington, NC which began in 2007 and is currently serving as President of the Coastal Carolina Clay Guild. Brian studied under Japanese-American Potter, Hiroshi Sueyoshi and currently lives and works in Wilmington, NC. “Ink on Paper by Bob Bryden” & “Photographic Reflections by Harold Hodges” is a new exhibit combining the work of two artists working in two very different media. Bob Byrden grew up in the Piedmont region of North Carolina. He is a graduate of Guilford College in Greensboro, NC. He went on to do graduate work in South Asian art history at the University of Michigan in Ann Arbor. His desire for a greater involvement with creative arts lead to Kentucky and graduate work at the University of Louisville where he received a Masters Degree in Art with a concentration in printmaking. In addition to art he has worked primarily in graphic design and commercial printing. Today he pursues his creative endeavors in his swamp side home/studio in Wilmington, NC. 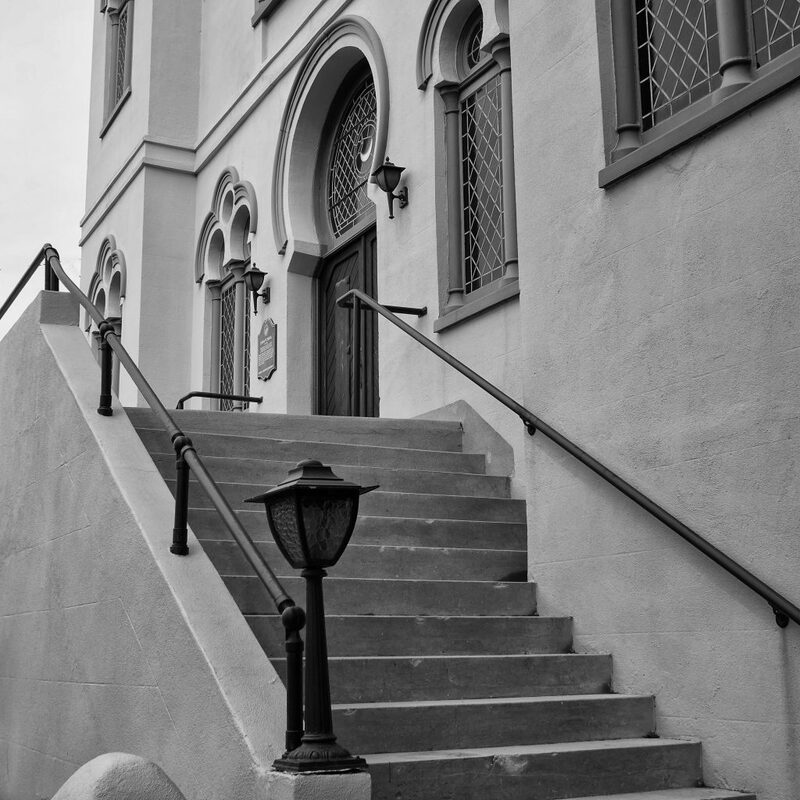 Harold Hodges is a photographer, living and working in Wilmington, NC. “Art Explosions by Jeffery Geller” runs through February 24, 2018. Jeffery Geller creates outside-of-the-box art including original art with paper, clay, paint, wood, and often found objects. Experience shadow boxes and art explosions outside of shadow boxes. 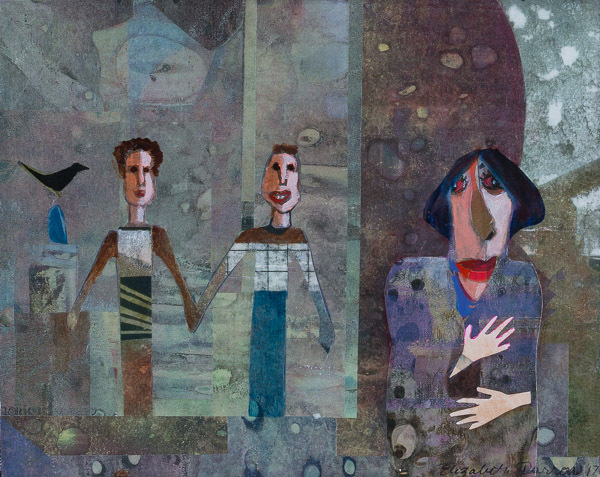 View paper mobiles, mixed-media collages, paintings, and ceramics. The artist will donate Fifty percent of the proceeds of art sales from “Art Explosions” to Breast Cancer Research Foundation (BCRF). 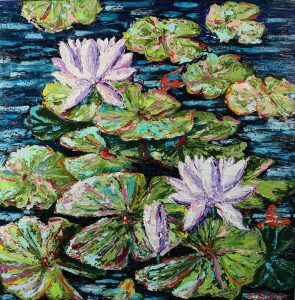 Click here to view the art of Jeffery Geller at Art in Bloom Gallery. Two artists, Catherine Porter Brown and Jeff Brown come together in the new exhibit Synergy. The art presents an interaction and cooperation with a combined effect, which is greater than the sum of its parts. The upcoming exhibit includes Jeff Brown’s newest assemblages with found objects along side luminous dreamscapes and portraits by Catherine Porter Brown, a classically trained oil painter. Experience the extraordinary oil paintings of Tatyana Kulida and Mio Reynolds. Born in Russia, Tatyana is a classically-trained painter who studied and taught art in Italy and now resides in New Zealand. Fellow artist and friend, Mio Reynolds lives in Wilmington, NC. Click here to view the work that was on view in the gallery. ExperiMetal is a journey of delving into techniques and materials to transform metal into contemporary art forms. 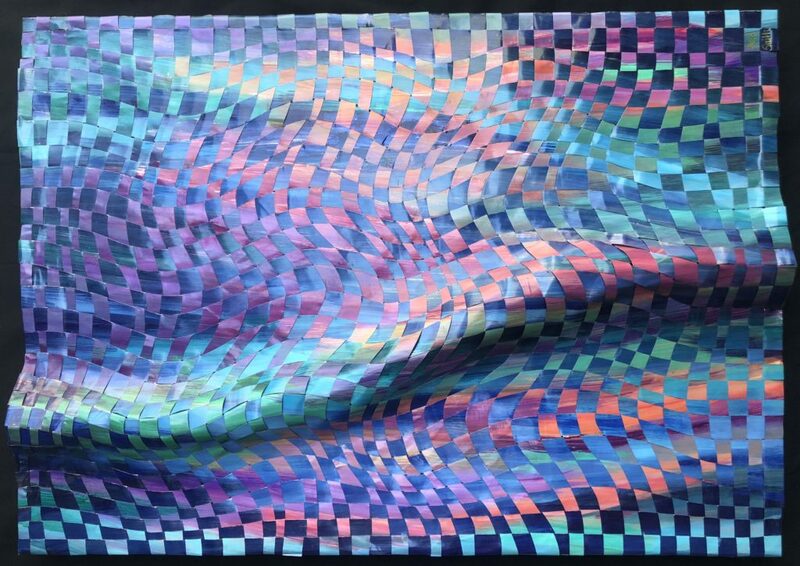 Exploring the relationship between painting, weaving and sculpting, while using various materials, allows formation of colorful, textured wall hangings that take on radically new tapestries and shapes. The versatility of copper and its’ uniqueness allows Gale Smith to experiment with different creative processes. Working with a wide range of materials can be evocative, provocative and oftentimes communicates a serendipitous interpretation by the viewer. Energy, fusion, transformation, exploration keeps the path of the creative journey open. Gale is collaborating with Alice Blake Powell to design, create, and wear a dress for the opening and closing receptions. 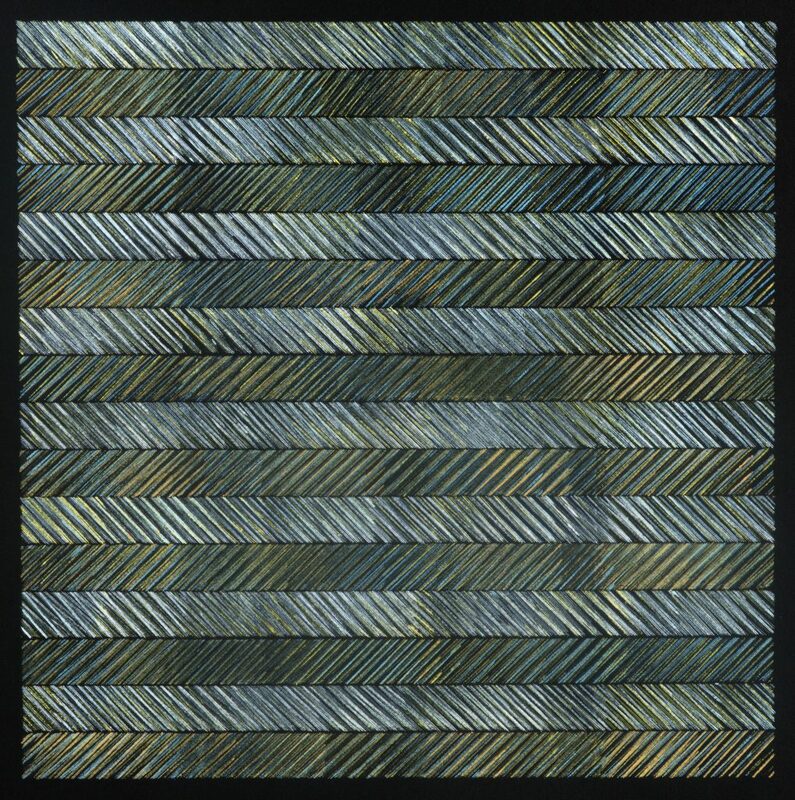 Alice will make the pattern pieces, and Gale will weave the copper tapestry to those pieces using various shades of blue. The copper dress will be displayed in the gallery during the art exhibit. Click here to view work that was on view in the gallery during the exhibit. Join us for an interactive art exhibit. Presenting indigenous youth cultural films from Maya Guatemala and the Lumbee tribe of North Carolina. This exhibit will display a variety of visual art and textiles from the respective vibrant communities. Unlocking Silent Histories opens spaces for indigenous youth to critically analyze how they are represented in the media and to creatively express their worlds from their perspectives, in the form of documentary films. It also contributes to the promotion of cultural understanding by connecting youth across generational and geographical boundaries. 100% of sales from this exhibition will be donated to Unlocking Silent Histories. “Art of the Gift” opens on November 1st and continues through December 30th. The art exhibit celebrates the holidays and features one-of-a-kind gifts selected from our collection of original art. Choose from exquisite jewelry, paper art, hand-crafted wood, weaving, ceramics, paintings, blown glass, sculpture, mobiles, stained-glass mosaics, and more. You will find something for everyone with prices starting at $10 for woven paper art and with many works of art under $50. Original works of art by local artists include: Debra Bucci, Richard Bunting, Brian Evans, Susan Laswell, Joan McLoughlin, Cathie Schumaker, Gale Smith, Traudi Thornton, and many more! The exhibit and sale will also be presented alongside “Traudi Thornton: From the Studio to the Gallery” exhibit with complimentary gift wrapping available. 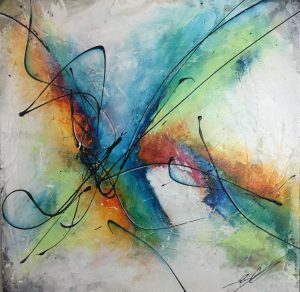 Meet visiting artist, Helen Lewis, during a special Pop-Up Exhibit featuring her latest encaustic paintings during Downtown Wilmington’s Fourth Friday Gallery Nights. Helen Lewis concentrates her fine art in the areas of encaustic, cold wax and oil, and mixed-media collage. In addition to Art In Bloom Gallery, she is represented by galleries in coastal Maine and along the shores of Lake Michigan in Door County, Wisconsin and Michigan as well as in Roswell, Georgia. 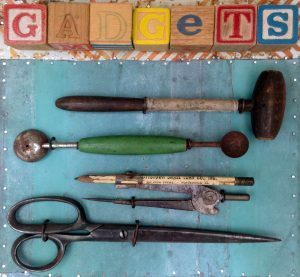 Click here to view some of the work that will be on view in Helen Lewis’ Pop-Up Exhibit. 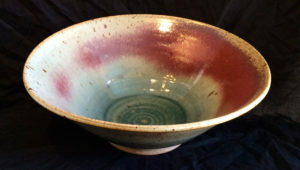 Art in Bloom Gallery presents a special artist showcase and studio sale by ceramic artist, Traudi Thornton. 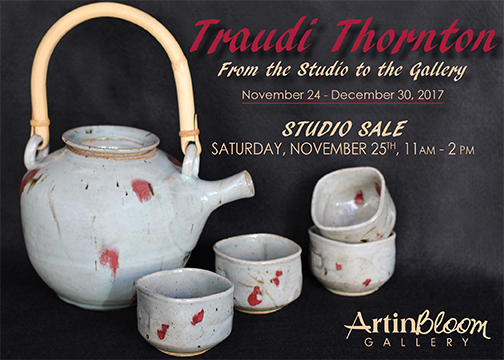 Traudi’s handmade, one of a kind ceramic work will grace the gallery with a special sale on Saturday, November 25th. Traudi will be in the gallery from 11am until 2pm. Guests will enjoy refreshments and get a start on holiday gift shopping. Traudi was born in Czechoslovakia and raised in Germany. She first studied music at Creighton University before studying ceramics with Henry Soreco at Creighton, the University of Nebraska at Omaha and then moving back to Germany. The artist relocated to Wilmington in 1983. Additionally, Traudi completed a Raku workshop with Paul Soldner in 1974 at the University of Nebraska at Omaha. The artist showcase will be presented alongside “The Art of the Gift” exhibit and sale with complimentary gift wrapping available. 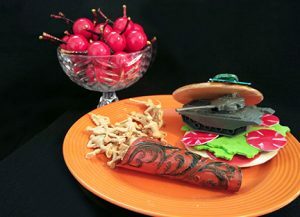 Each piece is one-of-a-kind; hand made from carved and painted wood (buns and bullets) salvaged materials (barbed wire and bailing twine, pieces of plastic, green “flip flops” from pedicure shops) acrylic paint, inexpensive toys (guns, planes, tank, army men), clay (crown roast and game hen), china and eating utensils from thrift shops. We are delighted to celebrate the Satellite Venue Exhibits in our partnership with CHECKER CAB productions and local restaurants to display and sell work by Art in Bloom Gallery’s artists. Join us for a sampling of the art and hors d’oeuvres by Platypus & Gnome and Pinpoint Restaurants. The 2nd annual, American Craft Walk Wilmington is scheduled! This year’s craft walk will run along Front Street from Orange Street in the south end of downtown up to Grace Street. All along you will find fine craftsmen selling their art. On stage will be musicians, dance and demonstrations. This event will be Wilmington’s celebration of American Craft Week. American Craft Week is a nationally established effort to build awareness of the Arts, Craft and Culture in America founded by CRAFT.org, a non-profit. Art in Bloom Gallery’s booth will be located on the corner of Front and Princess Streets in front of Bourbon Street Restaurants. Art in Bloom Gallery will be hosting a special traveling exhibit in Southern Pines, NC, which will feature many artists of Wilmington. The Belle Meade Art Studio is located at 100 Waters Drive in Southern Pines, NC 28387. Enter the exhibit via the Clubhouse Main Lobby. Elizabeth Darrow and Dave Klinger have joined forces to create an unusual series of masks. Dave builds the structure, then passes it on to Elizabeth, who creates the personality suggested by the shape. David Klinger creates the basic mask form using layers of recycled paper and cloth, at times built around chicken wire, wire cloth, clay, aluminum, cardboard, and various face form armatures. For bonding the substrate, the artist uses non mold-supporting adhesives like PVA and adds plaster of paris for hardness and strength. The completed form is then air dried and sealed with acrylic modeling paste and gesso. Elizabeth Darrow uses oil and acrylic paint for color and various materials such as silk scarves, beads and stones, dryer lint, feathers, and branches, to bring each mask to life. An exhibition celebrating art by three friends who met in Germany after sharing a classroom and a love for plein-air painting and pastels. Carole Osman, Pamela Mork-Keegan, and Linda Sells reunited in Wilmington to exhibit paintings and pastels. 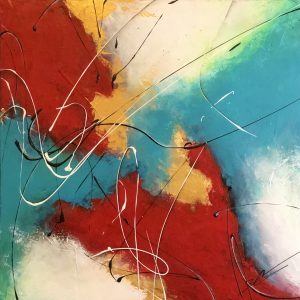 Dine at The District Kitchen and Cocktails to view the new exhibit of abstract expressionist paintings of Bradley Carter. Click here to view a selection of works that will be located at The District Restaurant. The District is located at 1001 N. 4th Street in Wilmington, NC. The art exhibit “Elements of Creation: New Art by Brian Evans, Georgeann Haas, and Judy Hintz Cox opened on June 2nd and continued through July 29th. All of the artists use elements of the earth as mediums to create art even though the artists are working in different mediums. There is a playful and symbiotic relationship among the art work including Brian’s ceramics; Georgeann’s acrylic, ink, pencil, collage, and mixed media on paper; and Judy’s oil and mixed media on canvas. The featured art exhibit, “Sibs: New Art by Michael Van Hout and Brooks Koff” continues through May 27th with tie-wire sculpture by Michael and stained-glass mosaics by Brooks (brother and sister). Enjoy the originality and movement of this exquisite art. Also, mark your calendar for Saturday, May 13th, 2-5 pm to meet renowned mobile artist, JF “Jay” Jones visiting from Greensboro, NC with his latest metal, polymer, and wood creations. SpringHill Suites Marriott at Mayfaire, in partnership with Art in Bloom Gallery, invite you to a special reception. A pop-up exhibit “Coastal Colors: Oil Paintings by Debra Bucci” will be on view on Wednesday, August 29th with a reception from 5-8pm. 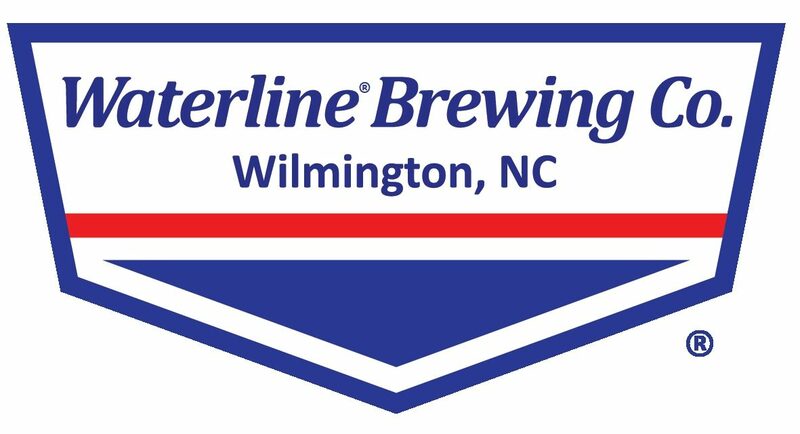 Meet the artist and enjoy complimentary craft beer provided by Waterline Brewing Company. 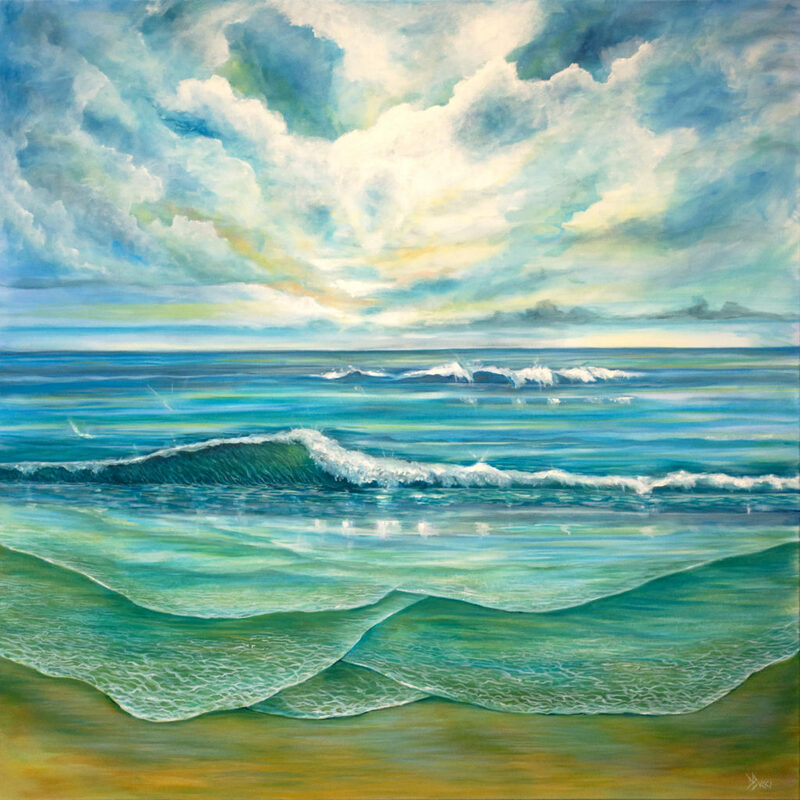 Debra Bucci is a published illustrator and has achieved success as a licensed fine artist. 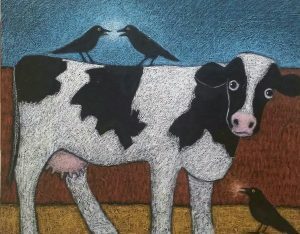 Her art has been featured in Plow & Hearth magazine and can be found on ArtNeedlepoint.com. She has public and private collectors throughout the US including Savorez Restaurant and Wilmington Magazine. She is an anchor artist at Art in Bloom Gallery and is showing work at The Cameron Art Museum. She recently had a show at The District Kitchen & Cocktails and has exhibited at the Wilmington International Airport. Debbie has a BFA in Design from Drexel University where she studied oil painting and enjoyed a corporate career in Package Design. She has recently moved to Wilmington, NC with her husband “Art” and dog “T-Bone”. SpringHill Suites is located in the Mayfaire Shopping Center at 1014 Ashes Drive in Wilmington. Join us for a champagne toast and special reception at Pinpoint Restaurant on Wednesday, November 14th from 5:30-6:30pm to celebrate the visual narrative paintings in “The Familiar Distance in Going Home: Visual Narratives by Pam Toll” as part of our partnership with CHECKER CAB productions and local restaurants. My creative practice and visual language derive from a childhood steeped in family story telling. In these oral narratives, the men discussed the outside world – sometimes dark but often full of humor. Grandpa (Deputy Sheriff) Meeks delivered dark but true tales to the grownups, while my sister, cousin and I camped out nearby, listening but unseen. PaPa Wallace and his bachelor brother Floyd spun humorous stories about farming and animals and, later, vignettes about their adventures as high school janitors. The women delivered their stories while snapping beans, shucking corn or washing dishes. They covered birth and dying, and everything in between, and laced the details with gossip. Some of the women were like artists to me, working with thread, seed sacks and other found fabrics to make quilts. “Small Collage Art by Elizabeth Darrow” at Waterline Brewing Co.
Waterline Brewing Co. and Art in Bloom Gallery present “Wine at Waterline” and Art Showcase with local Wilmington artist, Elizabeth Darrow. This exhibit presents a selection of the artist’s collage art. 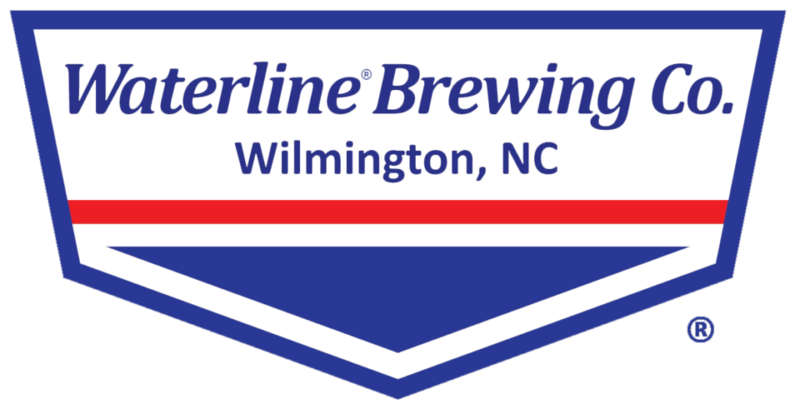 Waterline Brewing Co. is located at 721 Surry Street in Wilmington, NC. Join us for a special event “Munch and Art with Mark” on Monday, October 15th, from 11:30am – 2pm. Mark Gansor is completely self taught, learning how to paint through reading books and studying the work of others. 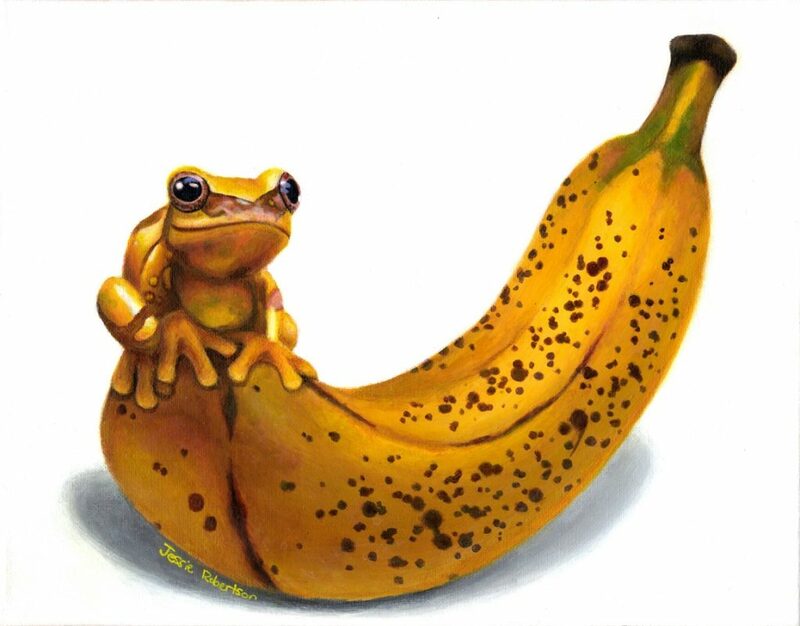 He has been trained in the application of fine Venetian plasters and has taken master classes in Trompe l’oeil painting. Mark began experimenting with decorative painting first as a hobby, but it soon it blossomed into a full-time profession. He now devotes his time to rendering decorative finishes, faux effects, plasters, and murals. He works in both residential and commercial settings and has painted in several buildings that are listed on the National Registry of Historic Places. This exhibit is in partnership with CHECKER CAB productions. The reception is free and open to the public. Please call 910-769-9300 for dinner reservations. Click here to view a selection of works that will be located at Platypus & Gnome Restaurant. The exhibit presents a playful and serene mix of global and local scenes by Mark Gansor and Carole Osman. Mark Gansor presents acrylic paintings of buildings, gardens, and fields in Wilmington and France. Carole Osman presents pastels, monoprints, collages, oil, and acrylic paintings of various locations in Japan, Germany, Turkey, and the United States. The opening reception is on Friday, February 10th, 6-9 pm. View original art; meet the artists; enjoy catering from Whole Foods; and listen to music by Cameron Tinklenberg, jazz pianist. The exhibit continues through Friday, April 7th. “Twice Around: The Make-Over,” with new art by Elizabeth Darrow and digital images by Susan Francy opens on Tuesday, January 24th and continues through Tuesday, February 7th during regular gallery hours, Tuesday – Saturday, 10 am – 6 pm and by appointment. Join us for a special reception, Friday, January 27th, 6-9 pm. View Elizabeth Darrow’s new oil and collage on canvas and Susan Francy’s digital images. Meet the artists. Singer-songwriter Rebekah Todd will play guitar and sing. “Visible Spectra: Paintings, Drawings, and Prints by Janette K. Hopper & Photography by Charles Kernan” will continue through January 20th, 2017 at Art in Bloom Gallery, 210 Princess St., Wilmington, NC. This joint exhibit presents stunning images of nature, people, and architecture transformed by light and shadow by the artists from their travels and time outdoors. Renowned international artist, Janette K. Hopper will her exquisite paintings, prints, and drawings including sumi ink paintings on rice paper. 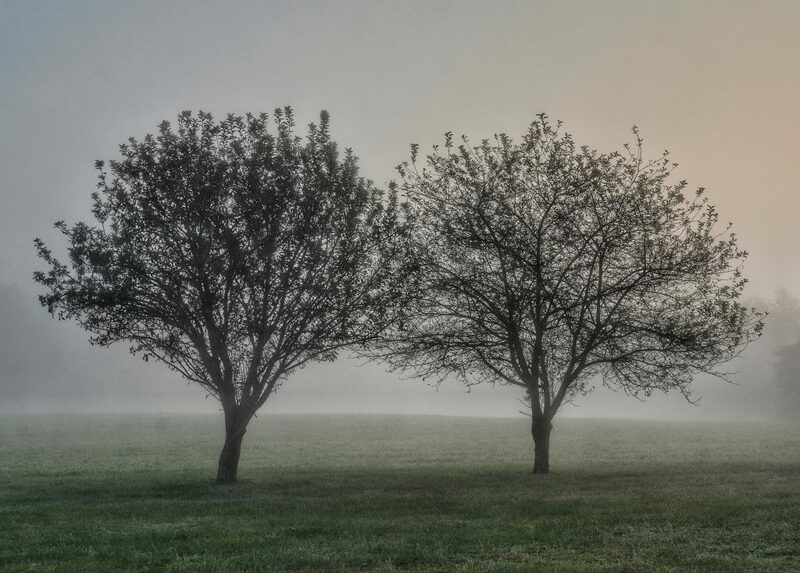 Emerging artist, Charles Kernan will exhibit his limited edition, fine-art photography and photographic prints. 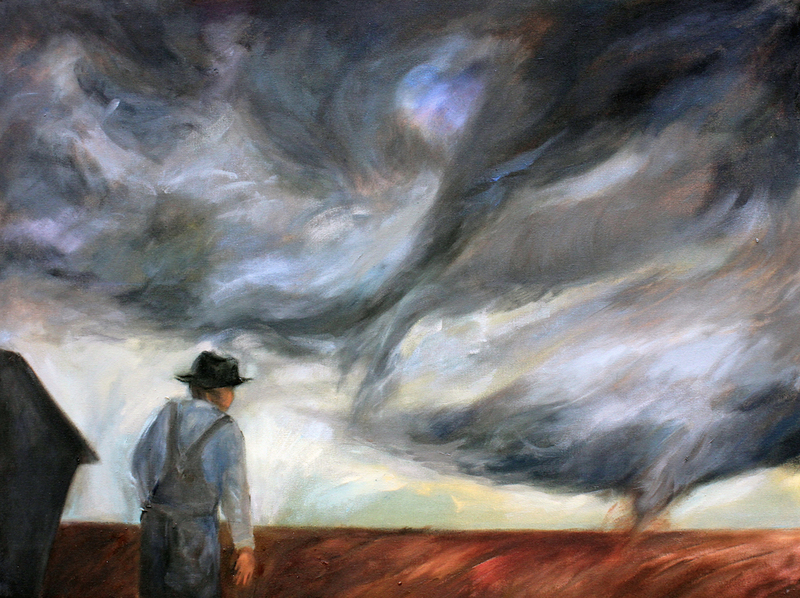 Together, Janette’s and Charles’ art work present an evocative “Visible Spectra” spanning many medias, techniques, and subjects. Ten percent of “Visible Spectra” art sales will be donated to Cape Fear River Watch. The closing reception for “Full Circle: Elizabeth Darrow, Traudi Thornton, and Susan Francy” will take place on Friday, September 30th, 6pm-9pm at Art in Bloom Gallery, 210 Princess St., Wilmington, NC. Meet the artists and view new work including oil and collage on canvas by Elizabeth Darrow, raku and stoneware ceramics by Traudi Thornton, and limited edition, fine-art photography and digital images by Susan Francy. Shirley Lebo of the Wilmington Symphony Orchestra will play violin. Helen Welsh will provide creative catering. Click here to view a slideshow of past and present art by Elizabeth Darrow. Click here to read an article in WILMA magazine on the web about Traudi Thornton. Click here to read an article in ENCORE magazine about Traudi Thornton. “Looking Within: Encaustic Paintings by Helen Lewis,” opened on Friday, May 13 in Gallery 2 at Art in Bloom Gallery located at 210 Princess Street, Wilmington, North Carolina. The exhibit closes on Friday, September 16, with a reception from 6 – 9 pm. Musicians Shirley Lebo (violin) and Sarah Stoloff (cello) will play at the reception and are both members of the Wilmington Symphony Orchestra.